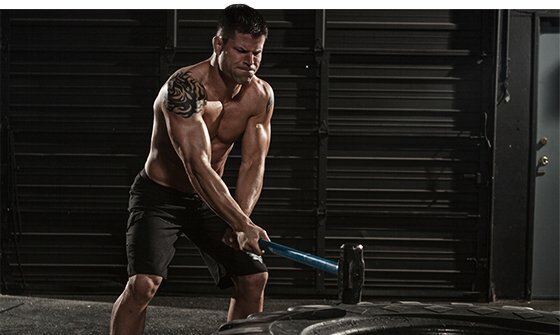 Load up on new training tunes with this playlist from retired UFC fighter Brian Stann. Log into Spotify and hear the songs he listens to as he lifts! Brian Stann&apos;s resume is impressive. He was a Captain in the Marines Corps and has been awarded the Silver Star for his bravery in combat. During his military career, Stann trained and competed as a fighter in the WEC and UFC. Although he recently announced his retirement from MMA, his fighting career was illustrious. He was a light heavyweight champ in the WEC and achieved a 12-6 fighting record in the UFC where fought in both the middleweight and light heavyweight divisions. He&apos;s also a husband and a father. If that&apos;s not awesome enough, Stann has a killer playlist that&apos;s sure to flutter any rock lover&apos;s heart. If you have big plans for the gym today, download this playlist before you go! What&apos;s the most difficult part about being a fighter? The toughest part of being a fighter is the sacrifice in your personal life that is necessary to be successful. Fighters by nature have to be a little selfish due to the intensity of their training. Fighters have one-track minds, which can be difficult if you are a father and husband. Once you have a fight scheduled, a percentage of your mind is constantly consumed with your opponent until that fight is over. "I found that I fight better when I&apos;m a little angry, but it has to be a focused aggression." Do you have to be angry, aggressive, or both to do well in a bout? Is there a "right mood" for fighting? Many fighters do not. I found that I fight better when I&apos;m a little angry, but it has to be a focused aggression. Too much emotion leads to poor execution. Many fighters struggle with their anxiety and emotions before and during a fight. I was able to condition myself to look forward to the fight. You listen to a lot of hard rock and metal. Why do you like training to that genre? I have been a metal and rock fan my entire life. I have always used it for motivation. I was never an angry kid, but I did always feel like I had something to prove. To me this music is not dark like some of the stereotypes make it out to be. It&apos;s really about digging deep and succeeding even when people don&apos;t expect you to. "Exercise is part of who I am. I&apos;m not nearly as productive in any other aspect of my life without it." Do you think music influences how you train? I always train to music: martial arts, weights, cardio, whatever I do. I love having music to help motivate me. Exercise if part of who I am and I&apos;m not nearly as productive in any other aspect of my life without it. The music helps keep me motivated while I train. I never work out just to work out—there is always a purpose, a goal. Music helps push me to reach it.